Graeme Dott came through a thrilling finish to beat Neil Robertson 6-5 at the Coral UK Championship, after letting slip a 5-0 lead. Defending champion Robertson won five frames in a row to recover to 5-5, only to lose the decider. 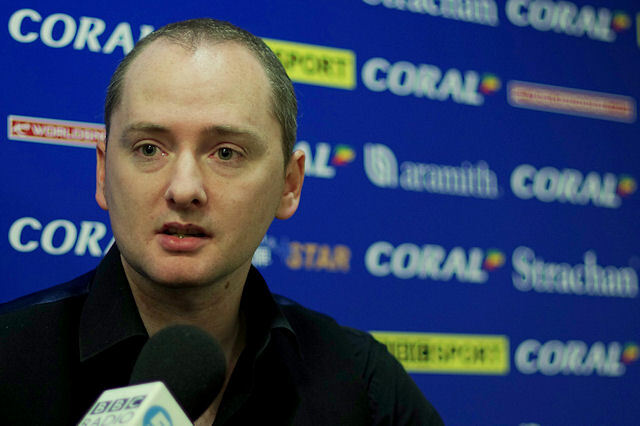 Dott goes through to Friday’s quarter-finals to face Stuart Bingham. The result means that Robertson will not retain the title he won here at the York Barbican 12 months ago and also guarantees that Ding Junhui will become the first Asian player to be ranked number one in the world, when the list is revised at the end of the tournament. Dott was cruising after winning the opening five frames without reply, including top runs of 63 and 52. However Australian Robertson was not ready to call it a day and played some of his best snooker to reel away the next five. Breaks of 72, 100, 59, 106 and 59 meant the match would go the distance. 2006 World Champion Dott was in with the first chance but could only make 22 before missing a red to a top corner. Robertson replied with 15 but was unlucky not to finish on the blue when he potted a red and screwed back off the pack. He went for a tricky brown to a baulk corner but it rattled in the jaws. That allowed his Scottish opponent back in and he saw out the match with a 56 break. “Everything was going good to go 5-0 up,” said Dott, who will be playing in the UK Championship quarter-finals for the first time since 2006. “I never felt I was playing that well because I felt I was cueing better against Robert Milkins. “Neil let me off the hook in a couple of the frames when normally he just clears up. I was surprised to be 5-0 up but then he started playing the way he normally does and didn’t really miss that much. “We saw it when Nigel Bond came back from 5-0 down against Barry Hawkins and you think ‘please don’t let it happen to me as well.’ If I let him see a red I just felt he was clearing up all the time. Robertson said: “At 5-0 down I just had to keep patient and keep calm and I played really well. Once I got some rhythm going, I knew that if I got going against any player in the world, I can reel of four, five, six frames in a row with heavy scoring. On the other table, Mark Davis ended the run of one of this week’s star youngsters James Cahill, beating him 6-2. Cahill admitted he wasn’t as sharp as he could have been for the match after only getting a couple of hours sleep last night following his dramatic win over Ding yesterday. Davis led 3-1 at the interval although Blackpool-based Cahill did win the next to close to one frame behind. However Davis managed to win the next three, with top breaks of 63 and 68, to ensure the win. “I felt a lot better than in my previous matches but it’s a real battle for me out there because I don’t think I’m on top of my game,” said Sussex’s Davis. “I did feel quite good out there tonight – maybe it was the two-table setup and a slightly different arena which brought back warm memories of two years ago.